Google Penguin 4.0 was released on September 23rd, 2016. Originally released in 2014, Penguin is one of the algorithms that determine where your blog will appear within Google's search results. More specifically, what Google looks at is the recency (freshness) of your content, PageRank, region and the words on your site. Both of these changes are very good news for webmasters that produce regular, compelling content. I especially appreciate the ‘granular' aspect of the change – which should make higher rankings for smaller sites easier to accomplish. 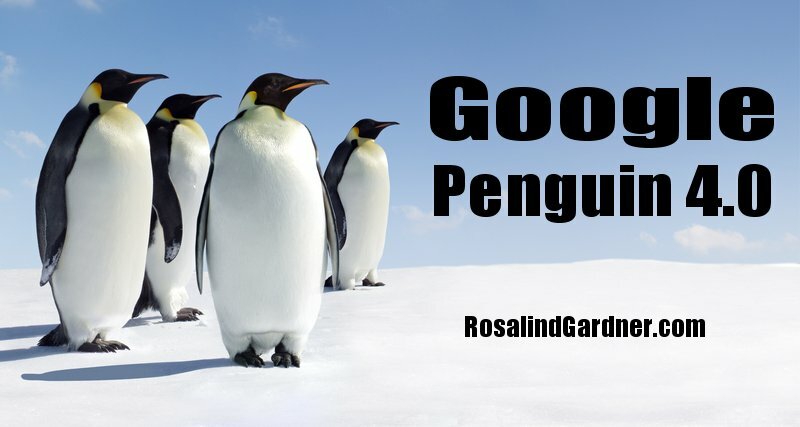 Did you find this post about Google Penguin 4.0 informative and useful? If so, please share it with others! If you have a comment, question or suggestion, please leave a comment below! I hope this doesn’t come off as too much a beginner question, but I ‘d like to know how you to the point of having such a grasp on the digital marketing market. With a lot information on the topic, I am having a hard time knowing what to believe and what not to believe. Any ideas? My sites have gone up, as always. Don’t game the system, make quality sites. Thanks Ros, good to know. I appreciate this update, Ros. It seems that our niche sites might get a boost over time with consistent updating. I agree, Connie. I’m seeing it already. Came up #2 in organic search results for “affiliate marketing” yesterday and today. Was AMAZED!!! Thank you very much for the update. I have dead it on some other blog as well. “More specifically, what Google looks at is the recency (freshness) of your content, PageRank, region and the words on your site”. I knew freshness matrix was in the algo for long as well as PR, region and the words( relevancy). But the significant change I think now it is refreshed in real time. So we can see the impact immediately. The other important factor is now a site will not be affected by negative SEO or poor link as spam link will be devalued. Hi Rosalind, if content freshness taking into account then personal blog which updated once a week will not perform well compare to corporate blog with team of writers and updated every day. You would think so, but I’m finding that’s not the case at all. I see more blogs being placed higher in the organic search results. Gotta remember that freshness is only one factor amongst many. Thank you for the new information on the Google update. Sounds like good new for us; finally! Thanks Ros, for an important update. The ‘granular’ bit is confusing for me though. What does this actually mean, and what do we need to do to take advantage of this change? Being more ‘granular’ means that now Google will not necessarily penalize a whole website for bad behaviour/lousy content/spammy keywords, but it can also penalize just a part of it.